Jeridan was baffled for a moment, before it occurred to him that this was technically not a military mission, which meant that no one in their group was necessarily following any procedure. Which meant that it was easily possible that Idran hadn't sent word ahead of himself to let the city's know what his plans were. It would have been a problem if they were asking for anything big, but that wasn't the case today. At any rate, he at least knew half of why this man was here questioning him. Where had the others gone that they hadn't been sought out first? Probably sight seeing. Oh well. "I was told we were planning on buying some gear and supplies, and then leaving the city." Spob nodded, and said, "I think I'll take a look around the city, myself. I'll meet you both at around ..."
He paused, before he gave Annie a nervous smile. For a moment, it seemed like his hair was suddenly pulled by gravity; the illusion must have reflected the way his ears drooped down. "I should be fine," he said, "But in case I get lost...is there any way I can get back in touch with you, Annie?" Annie nodded. "Find a phone, dial 5, then 8890-791. That's my cell phone." "You're magic." The girl replies. "You shouldn't be. You don't belong here." Kelne simply nodded, making a mental note of the number. Then, with an idle wave, he vanished into the streets, off in search of that centre of learning, the library. And of course anything else interesting he might find along the way. "From what I've seen you do and the fact you even know I have it is more than enough to say that, you, too do not belong here." Deeum also replies. 'That!" The girl exclaims, "Is there you're wrong! You're not from this world; I am!" "Well, Idran did say there were people here with magic naturally, but this girl is getting on my nerves already" Deeum thought. "Look, I don't care if you think I'm not from here or not. The fact of the matter is: You saw me and my friends, did something to me and the people around you, ran, and threw water at us, and ran again. If that didn't warrent hunting you down for some answers.. I don't know what else does." She said flatly looking eather aggravated to this girl. Honestly, she would've been a whole lot more reasonable if this grl didn't make her half nauseous and drench her in cold water. That last part was just very unnecessary. "You generally need to ask questions before you get answers." The girl replies, still fairly tense. While Deeum confronts the girl, Idran keeps a step or two behind her for now, catching his breath as silently as he can manage. He doesn't speak up right away, merely watching the exchange between the two albeit with a slight frown towards the target of their chase. Stepping to the side of the walkway, he puts one hand on the railing, just slightly leaning on it as he fights to keep a grimace down, before finally saying something. "...Are you trying to make this difficult on purpose, whoever you are? Maybe you are from this world, but Deeum's right, you've been acting much more suspiciously than we have. First you run from us, then you all but shout 'hey look at me I'm magic' in broad daylight in front of a crowd of people?" "Holy hell, Humans really are dumber than you look. Okay, look, magic doesn't matter one bit. But the fact that you're not from this world, well, that's going to be....Problematic. See?" 'Exactly how problematic? How is us being here getting your pants in a twist?' Deeum questions while crossing her arms. ' Besides, All this would have been avoided if you didn't freak out and run like you had something to hide. And don't you even start your tough girl act with me right now. I'm not in the mood for some girl acting big. Now tell us what is going on. If the strange girl had any other sense of magic in her, she'll know right then and there Deeum isn't some mere 'human' and she most certainly is not happy. "Well, see," The girl begins, gesturing, causing some of the foul smelling water to gush in geysers from the holes, "Now you're getting in the way of something very....Big." At the sudden rush of water, Idran coughs, if slightly. With a slight rasp to his voice, he speaks to the girl, still doing his best to keep himself upright. "Yes, I'm sure we are. And what is that, exactly?" With a small pause for breath, he continues, "I can't imagine it's anything good, from what I'm seeing here. It-" Coughing again, he leans a bit harder on the railing, trying but failing to get himself under control. 'Oh I do not have time for this!' Deeum growled stepping quickly to grab the girl by the shirt. The girl leaned back a bit, seeming a bit weirded out. "....You do realize that's a really stupid threat when I can't control his getting sick, and I'm a tainted water elemental, right?" "You seem to be under the impression that I'm the only one of my kind here, lady." The girl says, suddenly turning grim. Finally getting his coughing fit under control, Idran looks up to the girl, pale-faced and scratchy-voiced. Though his words are still interspersed with the occasional cough, he does his best to get them out uniterrupted. "So just how many of you are there here, then? And why are you here? I've never heard of a 'tainted' elemental before." "More than you could count in a lifetime. There's tons of us; every coin's got two sides, for there to be good there must be evil. Not to say we're evil, but we're certainly not goodie-goodies like the pures." The girl says. Spinning with a flourish, her clothes melt away, and her body changes. She faces the trio again, hands on her hips- Though her body now seems to be composed entirely of greenish water, with swirling impurities flowing around within her. "My name is Pandemic, like a disease. Pretty, dontcha think? Anyway, you guys are pretty much doomed if you hang out here too long, because soon the corrupt elements are going to swell on the streets, swoop down from the skies, and make this place a landmark to our power, so you might wanna get going, huh?" Later in the evening after the meeting with Hayward and Kasarov, the Gaerans are gathered again in a nearby conference room, seated around a long mahogany table with water and file folders set out for them. The D52 logo is projected from a device overhead onto a large white screen at the far end, and leading the presentation is a person unfamiliar to all those present, even Idran; a woman in a business suit with short-cropped blonde hair, very formal-spoken and rigid in posture. Her expression remains cold, not even the hint of a smile on her face, and she hasn't yet deigned to give a name to the others, barely even acknowledging them as they filed in. "Now that everyone is gathered, we can begin the briefing. As you can likely guess, we don't know much of Synergy's operations. However, we have managed to gain some intel on the location of their main base. We know that these facilities are located at an island 560 miles off the coast of the Wastes, known as the Isle of Marke. 31 years ago, a survey team examined and mapped the island, a reproduction of which is included in your dossiers, labeled 'Topographic Map of Isle of Marke 02-15-3724'." 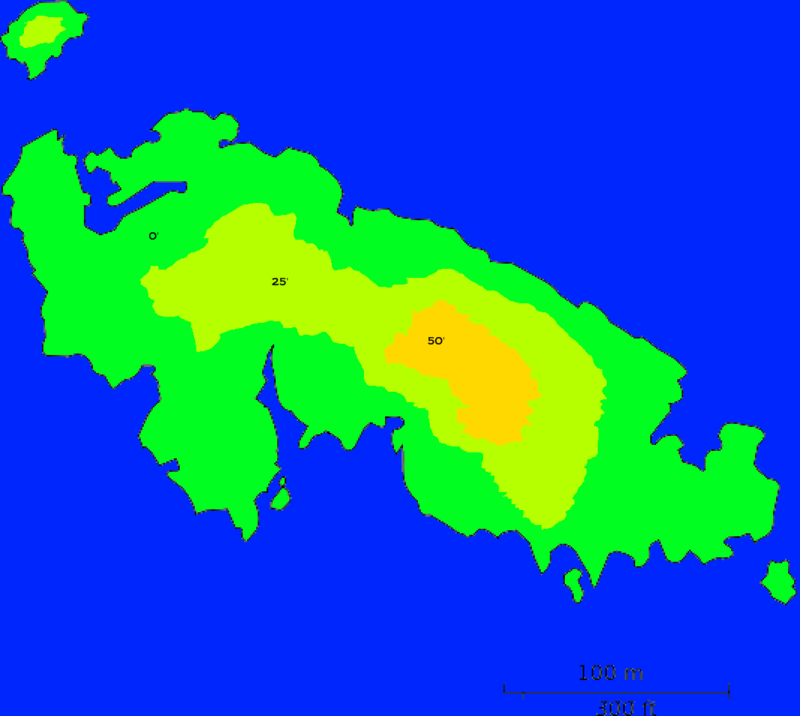 The logo disappears from the screen, replaced with a map of said island. "At the time, there were no structures nor habitations on the island, nor any unique wildlife, so it was of little concern to them, little more than a note in a file. However, recently activity was noted on the island, unlinked to any known organization or government. It wasn't long before this activity was connected to Synergy, the corporation of which you are already aware. We have not yet had any success in getting details of their operations, as their security and paranoia at such levels rivals even our own. However, we were able to obtain recent satellite imagery of the base, reproductions of which can be found in your dossiers labeled 'Satellite Imagery of Isle of Marke 04-09-3755'." 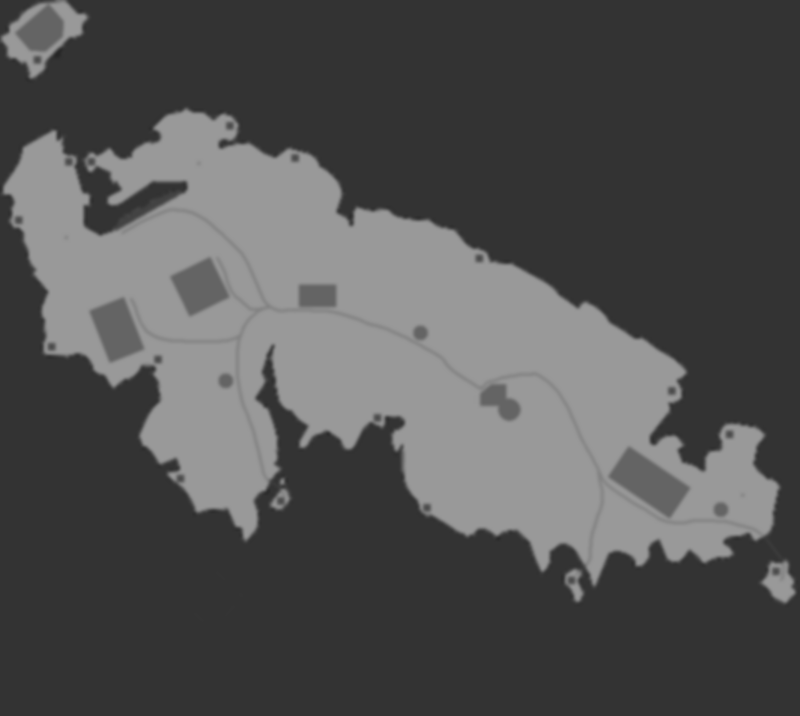 The image changes again, replaced with a blurry, black and white image of the same island. "Unfortunately, this is the limit of what we know of the current layout of this location. Any questions before we continue?" Jeridan followed along, examining the files in his dossier as the lady spoke. He didn't have any intelligent question yet, so he didn't respond when she prompted the lot of them. He might have been more irritated by her manner, were it not for the fact that his mind was countless miles away, over vast cosmic distances, at home. He'd quickly ducked a chance to return home the other night, but it wasn't for a lack of desire. He wondered what Phyllias was doing right now. Kelne was a tad curious about how they knew this facility held what they were looking for, as opposed to some other one, but this would surely be revealed in time. So far, there was very little information to ask questions about, so he simply said, "Carry on," whilst paging ahead in his briefing notes. If nothing else, he could certainly see the usefulness of technology which allowed a copy for everybody at very short notice. Nodding, she continues. "Now, from the information I've been given, you all seem to have a great deal of experience in dealing with hostile groups of all sort. Given that fact, your group is to have full discretion on this expedition. Now, as the location of the island is known, you could certainly try for the direct approach. However, I understand that you've already decided against this. Therefore, though I am certain you already have your own plans for how to collect the necessary intel, we do have one resource you could follow up on if necessary." She turns back to the screen, as it flips ahead to the image of a smirking man in a casual, yet still dressy, suit; in his 30s, with short, well-coiffed black hair, a mustache, and goatee - an image also reproduced in their dossiers. "Though most of our attempts have failed, we have managed to place one of our employees in a position to collect information on Synergy: an employee currently using the name Trent Kasden. Unfortunately, due to his deep cover and the lack of regular reports from same, we know little about the exact nature of this information. However, his main duty was to find other employees that may be exploitable for information on their operations. What little he has been able to get to us has proven useful so far - it was one of his reports that led us to discover the nature of the operations on the Isle of Marke in the first place - but you won't be able to use this resource without meeting with him directly. Most of our own employees are known to be such by Synergy, and vice versa, so we have been unable to set up a direct meeting since he went under without risking ruining his assignment. Thankfully, most of you aren't burdened by this. Given that you're new to this world for the most part, they will know nothing of your prior associations, with the exceptions of those that have been here before; thus, if you wished to meet with Mr. Kasden, you would be placing him and D52 at little risk, so long as your association with us was not advertised. "He is currently on the staff of another of Synergy's Waste-side facilities, and is known to make regular visits to a city on the coast of that continent. Rande von Welt, a small city where the only citizens are scientists studying the continent, their families, and some support staff to keep them together. With a population of barely 200 at the busiest times, you're sure to find him quickly were you to seek him out. "As said earlier, however, you are at your own discretion, and if you have your own ideas of how to handle this, you are free to pursue them. Given your vast experience, we trust you to be able to handle this. What we presently know of Synergy is at your full disposal, though this is largely merely the public face of the company. We are, frankly...still at something of a loss how they were able to get a hold of any of our or the Empire's files, while preventing us from much of same. Most of the information we have available, beyond that gained by Mr. Kasden, is quite basic. Public filings, governmental tax statements, and the like. Is there any information beyond this that would be necessary for your own plans?" Just to not give you all the wrong impression: for Rande von Welt, it would probably be closer to think of it as something like McMurdo Base in Antarctica than any real city; it's the closest equivalent to one on the Wastes, but it can only barely be considered one. Deeum looks at the man shown on the screen and can't help but get the feeling this man is probably going to give her one huge headache. Maybe it's the smirk or the fact that he looks like a gigantic jerk. She hasn't met this man, but if a picture is worth a thousand words.. its likely that her intuition is right. For now she flips through the folder and gingerly downs the glass of water in front of it. Having even THIS much information was kind of a new thing for Richard, really. Certainly a change from merely being pointed at the person to hunt down, or given a vague description. And they even got a man we can talk to if we really need some extra help, eh? Handy. Guess the real question is what plan we're gonna use to catch this guy. Either way, things seemed at the moment to be simple and easy, or at least, relatively so. It was almost sad, in its way. Eh. Seeing how things have gone so far, it'll probably get more interesting... although... Richard eyed his varied friends and acqaintances. Have to see the damn crazy plan first. At least, I HOPE we've got one. For now, Richard just hoped one of the others was a little more interested in asking questions. "I think we'll need to talk to Kasden if we're to have any hope of doing this quietly," Kelne said, "Though I suspect there'll be murder and mayhem before we're done either way." "As to your security problems, scrying is a very real possibility. A single competent diviner in a world without wards could learn a great deal." Jeridan simply continued to follow along for now, letting other people's questions and comments be fielded before making any of his own. The woman turns to Kelne, listening intently as he expresses his opinion, and nodding when he concludes. "While I am afraid the details are classified, I can tell you that divination, teleportation, and other such magical means are not a concern within the pyramid. Though magic may be extraordinarily rare here, D52 is well aware of its existence and has means to prevent its use to intrude on building and company security. Were it that Synergy's means are as simple as that, but I am afraid whatever means they have used must be more subtle and trickier than that." Kelne nodded thoughtfully, "We'll need some kind of cover for our visit to the city, along with transportation on to the islands," he said, I'd also like to peruse any reports on operations you may have launched against Synergy in the past. It may help me get an idea of their capabilities." "There have been no previous operations, I'm afraid; they are a fairly new company, and these acts are the first actions they've taken in the field. Transportation will not be an issue, and as for a cover, that can be arranged. Are there any preferences as to what sort of cover you would prefer?" Sorry for the long delay on this, it's entirely my fault, and there aren't really any reasonable explanations I can give. Also, unfortunately, Shaun will be dropping out of this game. His spot may or may not be filled, we'll have to see if we can figure something out there. "Scientists, family and support staff," Kelne mused, "I doubt we'd pass for any of them, given much scrutiny. Still, I think a private expedition may be the way to go. Just passing through, retracing the footsteps of the early explorers, etcetera. Gives us an excuse for having our own transportation, and we shouldn't raise too many eyebrows when we skive off after a few days." Okay, Shini and I are going to try to kick this into activity again. Everyone that's still got any interest in this RP, please post as soon as you can. Even just a one-liner or whatever is fine (though I'd certainly like if it was more), I just want to know who all is still interested in trying to get this back off the ground. With a basic plan in mind, the party is brought by boat to the mainland and given a healthy stipend of cash - 10000 credits in total - as well as a jet, chartered through an aeronautics company with no connections to D52. Idran and Annie disguise themselves somewhat for protection of their cover, and the seven of them - Deeum, Spob, Jeridan, Kelne, Idran, Annie, and Pandemic - begin the trip to the other side of the world. Their flight lasts for a full six hours, giving them ample time to see the land and ocean below, as they travel the 3000 miles faster and higher than any airship on Gaera. For perhaps the first time, they get a chance to see clouds from above, see the sunset glimmer through the air from 35000 feet. That evening, they make landfall at the airstrip outside Rande von Welt, a small facility with just the barest necessities of flight. There, Idran and Annie join them after quickly taking on their disguises: Idran's is fairly basic, enough to deflect those that might chance to recognize him from past events on Krynus, but Annie seems to have rearranged her features entirely, looking almost unidentifiable even to them. At curbside, after their luggage has been retrieved, they quickly and quietly walk the Gaerans through how to hail a cab, something sure to be an important piece of knowledge for them here. It takes them into town, where they are finally able to move to the next step of the plan. Synergy employees are supposed to be all over this city, it's only a question of how to get what they need out of them. And there's still Kasden and the information he's already discovered himself, of course. Although not one for gawping, Kelne had nevertheless been deeply impressed, even touched, by the view of Krynus during the flight. He'd never had the opportunity to look down on a planet like this before, and it was a sight which matched any he had seen in his life. With the added bonus that nobody was trying to kill him while he took it in. For this alone, the trip would have been worthwhile. Still, all journeys end, and Kelne was all business as they touched down. Deciding that Kasden was their best possible source of information to begin with, he volunteered himself to make contact, with perhaps one other person along. Any more might ring alarm bells. If Kasden didn't know enough, well, they'd cross that bridge when they came to it. Deeum was practically GLUED to the railing of the ship. She just looked around. Sure, she's been this high before, but not exactly in this form and she isn't focused on flying. So getting to see the beauty of it all was a nice change of pace. Though... this height issue with her current form is getting on her nerves. She's not quite used to being on her tip toes to get a good look at things. On landing, Deeum followed the others. There really isn't much she could do besides that at the moment. Jeridan and Spob hang back for now, ready to pursue their own plans. Meanwhile, Kelne heads off to track down Kasden, with Deeum coming along. Of course, that forces Pandemic to come along too, as the two can't be separated by too much distance in their current states, but surely he wouldn't find a pair of kids suspicious, right? Their briefing was quite accurate with regards to the size of Rande von Welt. It's so small that it's almost homey, bringing to mind a Doman village. The similarities end there, though. The buildings are all prefab military surplus housing units - long, squat units, all wholly identical and colored the same dull beige. Wooden poles stretch between them, connecting them with metal wires, and gravel roads wind amongst them on the ground. There's a few ground vehicles to be seen, mostly ones that look to be designed to haul cargo about the town. The ocean's easily visible even from here, with the tang of sea air wafting up from the nearby pier. Unfortunately for them, in a town this small, visitors are always easily noticed, and things are no different on Krynus. They won't be able to keep a low profile here, it seems, so hopefully they've well-memorized their cover IDs on the trip over. And as for finding Kasden, though the place is small, hoping to spot him may take some time. Names are subject to each person's approval, of course, so anyone that would have requested a different one would get it where possible. Blending in hadn't been all that difficult back in the city, but Kelne suspected it would be a bit trickier in a smaller environment like this. Wandering about in circles all day glancing at the faces of random people to track down Kasden... Well, that might be a tad suspicious. Kelne, operating on the theory that the man had to eat, opted for a brief orientation tour of town, followed by lunch at one of the more prominent establishments. Sure, the approach might not work, but it was best to go with the subtle approach to begin with. Even with all the time he spent on Krynus, Spob could still be surprised by what this world have to offer. The ride, that machine, that view...it was amazing. Absolutely amazing. Soon it was over; while the ride may have dragged on to some people, it was still faster than anything Gaera had to offer outside of teleportation. Now it was time to work. Kelne and Deeum had gone off, which left Jeridan and Spob to their own devices. "So," he said, with a shaky smile and a voice that was only half-joking, "Do you have any bright ideas?"